Party Casino managed to gin your attention right? No wonder, as they are one of the leading online casinos with hundreds of video slot and other kinds of casino games on their sites, from providers as large as Net Entertainment, Microgaming, WMS, IGT, Edict (Merkur Gaming), Yggdrasil, Evolution Live Dealer and many others. With a licence from the UK Gambling Commission and Government of Gibraltar, they are making sure all the protection measurements are taken to present the players with the best gambling experience while feeling safe at the same time. The best thing is that they have the whole website translated in German and Russian, apart from the main English version of it. They are in love with the purple colour, and you will see it everywhere where their name is associated. That’s the colour of their website as well. As soon as you enter, you will see a few bring and smiling faces that are pretty happy to offer you their bonuses and promotions on the big screen that is on the top of their site. The best welcome bonus that is dragging players on their site is 100% Welcome Bonus but we will talk about the promotions a bit later. Above the banner, the categories of games are there, presenting jackpot slots, new games, slots, live casino, blackjack, roulette and much more. Just below the big banner are the selection of games where you can see the featured games, new games, jackpot games, live casino games and the slots that they offer. 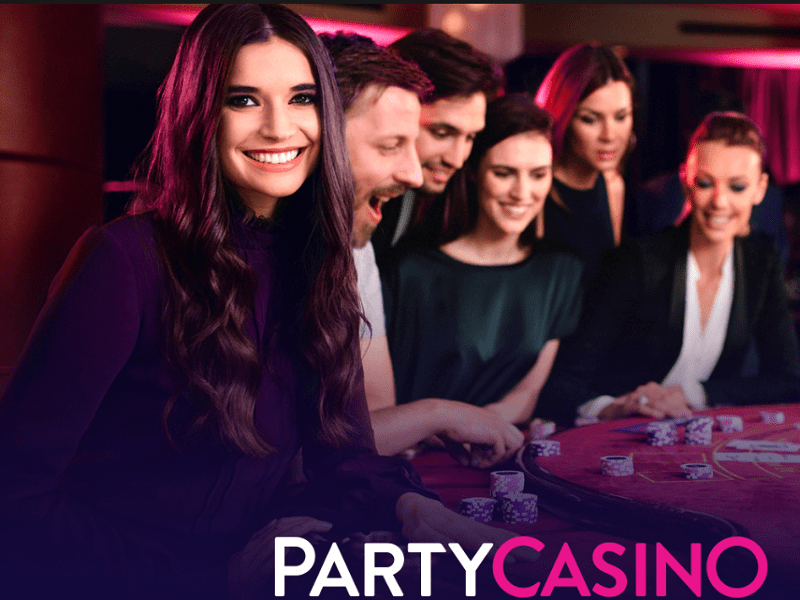 Scroll all the way to the bottom to find out more about Party Casino, something similar that we are doing in this review. As we already mentioned, there are tons of games that can be found on the pages of Party Casino, one of the largest casinos in the online gambling industry. Their slots, table games and mini-games come from some of the top producers like Net Ent, Microgaming, WMS, IGT, Edict (Merkur Gaming), Yggdrasil and Evolution Live Dealer. But it is not only slots that can be found on the site, as Party Casino wouldn’t be one of the best casinos if it offered slots only, right? All of the games have several tables to choose from, so make the choice and give it a try. 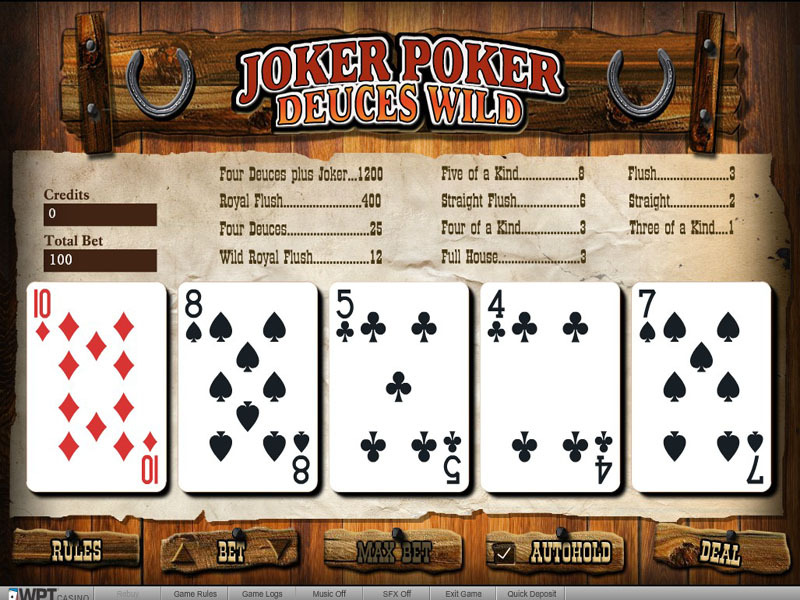 With the rise of the mobile gambling industry, the demand has risen as well. If you want to be one of the top casinos in the industry, you have to follow every new trend quickly. Party Casino know this, therefore, they managed to create around 200 mobile compatible games (until now) that are played on the mobile device. If you have an Android or an iOS mobile phone, you will have no problem playing these games. We all know that the welcome bonuses ate the most important thing when choosing a casino. There might be some other better parameters in the casinos’ portfolio like payment times and a number of games, but somehow the promotions and welcome bonuses that the casinos give away are the things that invite us the most on their pages. On Party Casinos’ pages, you will see one welcome bonus which is awesome and most definitely catches our attention. 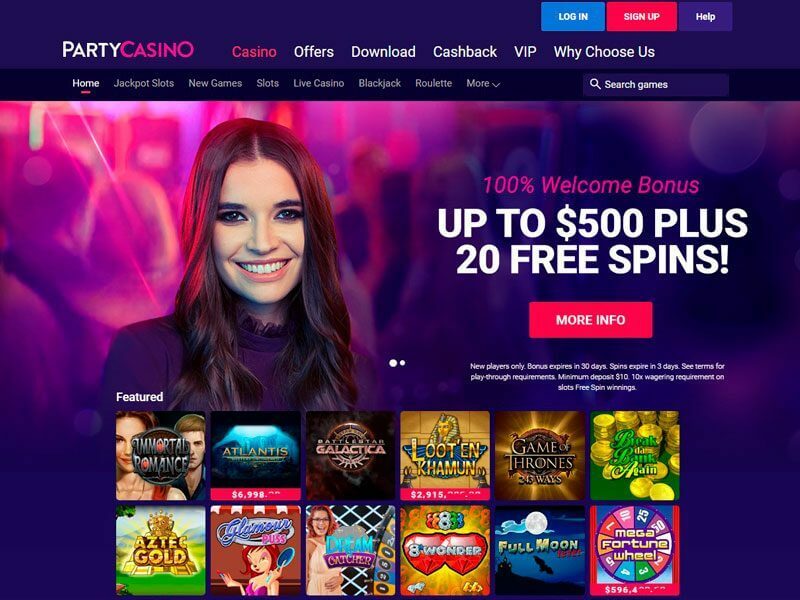 Tons of other promotions await you and everyone who wants to play the games on Party Casino’s site, but the promotions keep on constantly changing. There are daily, weekly and monthly promotions, as well as promotions regarding some certain event, so you have to go and check the website on your own, as the promotions tend to change rapidly. Don’t forget to read the casino terms when making a deposit, as only that way you will be eligible for the welcome bonuses that they offer. To be at the top, you have to offer a top-notch security to your players. Party Casino has a 128-bit encryption which ensures safety and privacy of every bit of information that enters the site. In addition, all the games at Party Casino have been audited by iTech Labs. Sad to say, Party Casino does not accept players from Poland, German Federal States of Saxony, Baden Württemberg and Hesse, or any territory where it is not legal to participate in online gaming including the United States. Withdrawal Limit: 20000 USD per month for the least VIP level, 150 000 USD per month for the highest VIP level. Withdrawal Methods: Bank Wire Transfer, Cheque, ClickandBuy, Neteller, PayPal, Ukash, Visa Electron, Visa, Skrill. Check Party Casino out, or find any of our other Casinos to see their Welcome Bonuses and make your decision where you’d want to play.